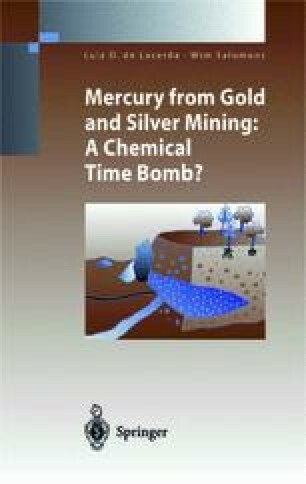 Mercury from Gold and Silver Mining: A Chemical Time Bomb? Human contamination by Hg in gold and silver mining has been reported from various sites throughout the world, since the large-scale use of Hg was introduced as the major mining technique to produce silver in the Spanish colonial Americas (Galeano 1981). Present-day surveys carried out in many countries have shown that contamination is mostly reflected by higher Hg concentrations in body indicators (e. g., hair, urine, and blood). Nearly all surveys carried out at gold and silver mining sites worldwide have shown these concentrations to be higher than expected background levels. However, only a few studies had actually detected symptoms or clinical signs of Hg poisoning. Most health authorities agree that the lack of information on “mercurialism” among the exposed population is probably due to difficult logistics and the poor health conditions of the population which may mask symptoms of mercury poisoning.